Famed songwriter and movie director Liu Jia-chang 劉家昌 came out with both guns blazing yesterday evening, at the 18th Anniversary Celebration of the Founding of the New Party. 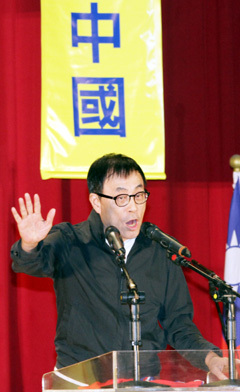 Unhappy that Blue and Green camp candidates were falling over each other proclaiming that they were running for “President of Taiwan,” surprise guest Liu threatened to declare his own candidacy for the upcoming 2012 Republic of China Presidential Election. Liu said that if by September 20th, none of the candidates made clear that they were running for President of the Republic of China, and not “President of Taiwan,” he would throw his hat in the ring. 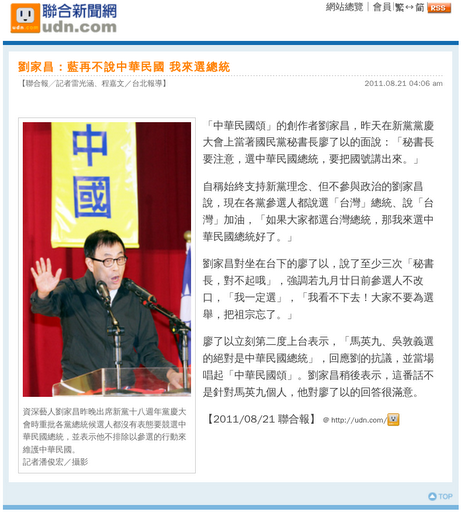 He said that people should not forget who their ancestors are, merely for the sake of a few votes. Liu’s “An Ode to the Republic of China” is comparable to “America the Beautiful” in both its spirit and lyrics. But Liu said he saw posters that read “The Centennial of Taiwan’s Founding.” His reaction was, “Has a Nation of Taiwan really been founded? and flatly turned down the invitation. Thank you, New Party, for keeping the Blue Camp honest.